Our view is non-consensus, and we’re okay with that. For the most part, the economic consensus in Australia is that the next interest rate move will be up. The current debate centres on when this move will occur, with the more dovish commentators suggesting we may have to wait until late 2020 to see the cash rate move to 1.75% from its current 1.50% setting. In February 2015 we put forward the case for Australian interest rates to approach 0%. At the time this was a non-consensus view, and the official cash rate was 2.50% (it was cut to 2.25% not long after). Of course, today the rate is stuck at 1.50%. 1. 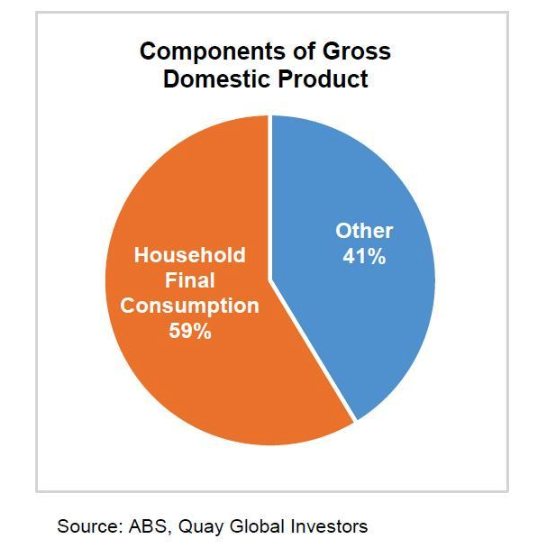 Households on balance need to net save due to a) the requirements of the superannuation guarantee system; and b) the fact that, on average, wealthy households tend to save more than they earn and the less wealthy cannot sustainably spend more than they earn. 2. 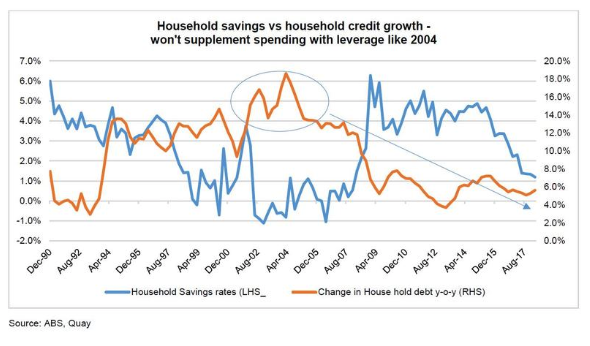 In the past, certain households could supplement spending, despite low savings, by increasing leverage (borrowing) against real assets, as occurred in 2000-2005 (see chart below). 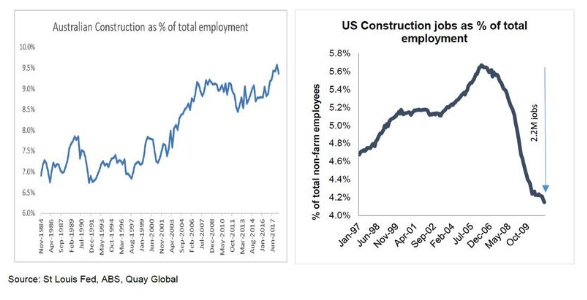 In the current credit environment, this is almost certain not to happen again to the same degree. In May 2017 we outlined our concerns for the Australian residential property market. As auction clearance rates fall and house prices correct, it seems this paper has aged well. 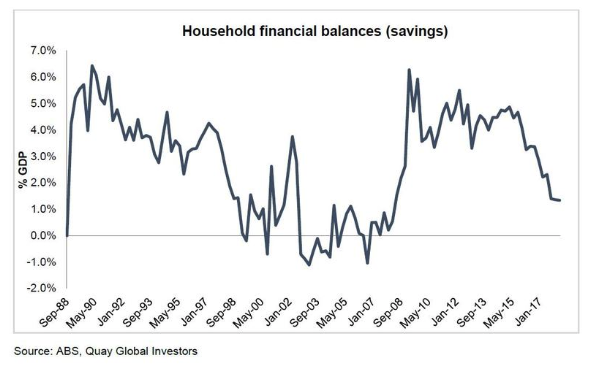 • the almost inevitable rise in household savings, impacting 60% of GDP via household consumption. So apparently we need to reduce rates further to help the overleveraged borrowers (in Sydney and Melbourne) in there overpriced houses. Just keep reducing rates eventually to zero.? What then hmmm? No,there needs to be increases in rates to back to “normal”levels, with overleveraged borrowers taking a haircut in line with reducing house prices especially on the East coast. They may we’ll be forced to sell and the financial institutions will have to deal with that too. For far too long rates have been low contributing to this circle of lowering rates and increasing house prices. As for the developers ,they will have to reduce prices and lose some money. All the talk is that there is a recession coming and if we are stuck on zero rates we are stuffed. The Reserve Bank has got it wrong for years and whT will 5ey do then ? 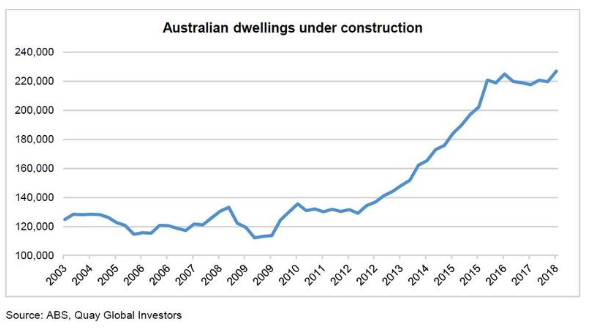 Surely the RBA has to be cautious in reducing rates just because house prices are giving back a small fraction of the gains they have accrued over the past 3 decades. It's pretty clear that prices have been bid up BECUASE rates are much lower, resulting in much higher borrowing capacities, and if the RBA now responds to a fall in prices by reducing interest rates even further, this simply reinforces the behaviour. Most would probably agree that if we could simply halve the current house prices and double interest rates, society as a whole would be much better off. Of course, it's impossible to do that now without causing great pain to those who have bought in the past 15 years, but let's not make things worse by cutting rates as soon as there is a relatively small correction after such a huge run-up. Reducing interest rates is only done to encourage more borrowing (and hence spending), which just brings forward future consumption. Given our current levels of debt, surely it's about time we started to live within our collective means for a while, or are we planning on leaving the bill for the next generation? Hi Robert. Thank you for your comment. I agree with much of what you wrote. I think a far better outcome would be to keep rates steady and for a large scale tax cut and fiscal expansion. That is the easiest way to get money into the hands of households, sustain the savings rate, and support the economy. Unfortunately this response does not appear on the political agenda. The Govt seem happy to have the RBA manage the economy - and when your only tool is a hammer, every problem looks like a nail. Hi Ian. Thank you for your comment. I agree with your comments. 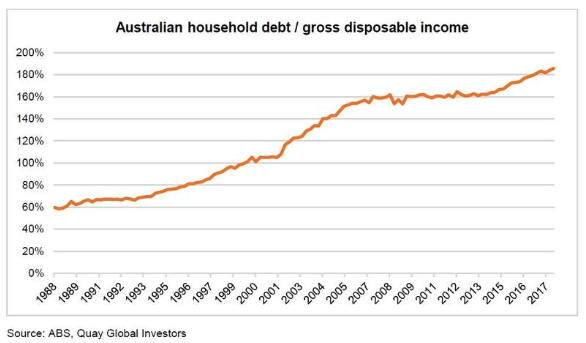 And I also believe the RBA will be very reluctant to reduce interest rates further due to recent experiences in the residential market. But if we are correct about the macro effect of household savings the real economy will slow. In that regard, please note the paper is a prediction rather than a recommendation. And if the RBA does cut interest rates, I do not think there will be much benefit for house prices in the near term. The current pipeline of new supply is too great. One thing you have not touched on is the exchange rate and the Australian dollar which is already struggling against the US dollar. With a few more rate increase expected in the US, for the RBA to reduce rates that will be a massive hit to the Aussie dollar. Hi Ronen, This is true! The currency can be a great shock absorber for a relatively small country like Australia. Separately, a strong fiscal response from the government will also prevent the RBA from moving..hence the title of my piece includes the word 'probably'. Nothing is ever certain.